Need more living space? Room additions may be the perfect solution. 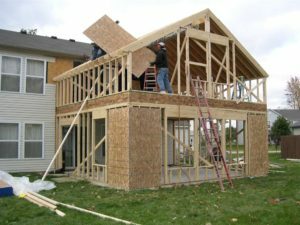 Homeowners in Guilford County, Wake County, Mecklenburg County, Stokes County, Davidson County, Rowan County, Carrabuss County, and the surrounding NC communities can feel confident in turning to American Renovations – a full-service design/build contractor that has been trusted for years by North Carolina residents to transform their homes through room additions. True room additions – Add an entire room, such as a great room or dining room. Or, consider a new room and more, like a family room plus an extra bathroom, or a master bedroom suite with an attached dressing area and bath. Garage conversion – Capitalize on this often underutilized area and expand your home’s liveable space without adding to it. Sunroom – Add space and natural light with a solarium that allows you to enjoy the beauty, serenity, and energy of nature year-round. “Bump out” – Extend the square footage of an existing room, perhaps by converting a powder room to a full bath, creating a dine-in kitchen, or adding a “mini library” with a comfortable window seat and integrated bookshelves. As your room addition contractor, American Renovations will help you develop your ideas and work closely with you throughout your project. Your room additions will be completely customized to your style and preferences, and we’ll spend all the time necessary to answer your questions, explain your options, and provide regular progress reports.